I’ve always been a big fan of potato salad. 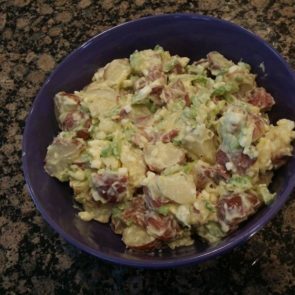 One of the few things that my mother made that didn’t come from a box or can was potato salad. She made it fairly simple, and it was delicious. A couple of years ago I started making it with baby red bliss potatoes and absolutely love it! Baby red bliss potatoes are delicious, even with the skin still on! Scallions are the perfect light onion flavor that doesn’t overpower the rest. Simple and easy, and gone in a flash.